LTFRB Says There are No Laws That Can Regulate Angkas. How True is That? The Land Transportation Franchising and Regulatory Board (LTFRB) has resumed its crackdown of drivers of Angkas, the motorbike-hailing company, starting December 12, Wednesday. This comes after a rollercoaster year for Angkas. The LTFRB initially suspended the company’s operations in November 2017, but was then allowed to go back on the roads through a writ of preliminary injunction grant from the Mandaluyong Regional Trial Court (RTC) in August, only to be obstructed again by a temporary restraining order against the RTC’s order from the Supreme Court last December 5. The main reason for LTFRB’s indefinite suspension of Angkas’ operations in November 2017? The regulatory board said it was because the services Angkas provides are illegal, since no law has been passed in the country that allows motorcycles or any two-wheeled vehicles to transport passengers in exchange for money. But it’s not like there have been no attempts from the Congress to regulate motorcycles as a type of transport service. Looking through all the bills filed in the lower house since the 14th Congress up until the present, a total of 15 bills have been filed (and refiled) by eight congressmen. None of them, however, have been passed into law. Almost all, or 14 out of the 15 bills, are still either pending with the lower house’s Committee on Transportation or have been left under study by its technical working group. 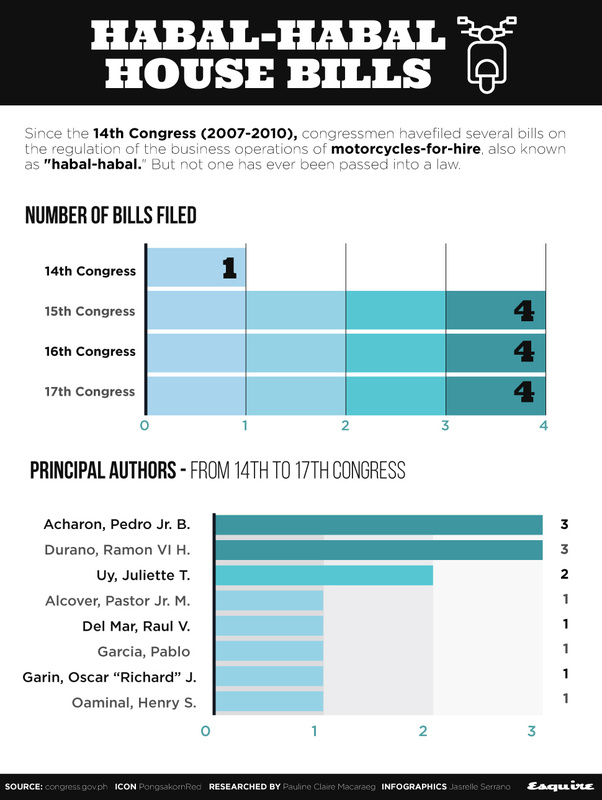 Only one bill, the Motorcycle-for-Hire Act of 2007,filed by Cebu’s 5th District Representative Ramon "Red" Durano VI during the 14th Congress, was approved by the House, and made its way to the Senate in 2008. But it was never ratified. The bills filed share two main concerns: one is for the regulation of the business operation of motorcycles-for-hire and other related purposes; and the other is for the devolvement of franchising powers of such operations to cities and municipalities. * Minor edits have been made by the Entrepreneur.com.ph editors.